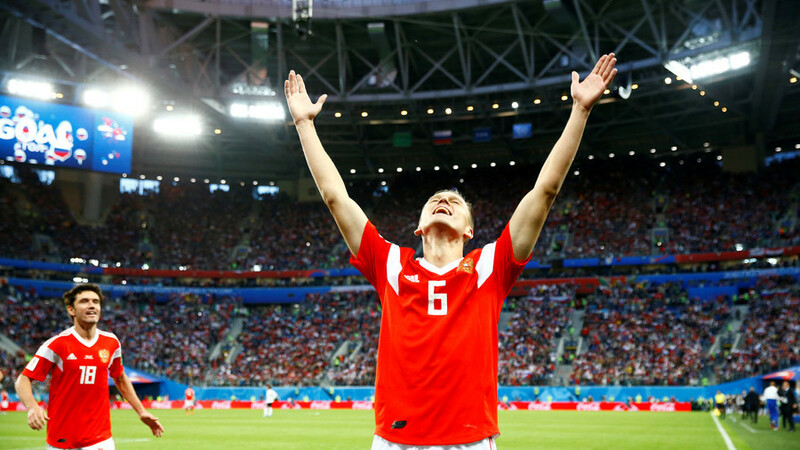 Russia continued the perfect start to their own World Cup, overcoming Mo Salah’s Egypt in the torrential rain in St. Petersburg to all but guarantee their place in the knockout stages of the tournament. Second half goals from Denis Cheryshev and Artem Dzyuba, added to an Egypt own goal, were enough to claim the three points and place Russia atop Group A, while Salah’s late penalty did ensure that he became just the third Egyptian player ever to score in a World Cup. Try as he might, the Liverpool forward was unable to inspire his team to victory in his first game since badly injuring his shoulder in the Champions League Final almost four weeks ago. Despite the negativity surrounding the team as they failed to win any of the seven warm-up matches in advance of the tournament, they now find themselves sitting pretty at the top of their group, with their eight goals scored in the first two matches among the most scored by a team in a World Cup since 1974. Below is a sample of the social media reaction to the Russian victory, as Egypt fans come to terms with almost certainly having to book an early flight home.